The Prime Scholarship is for students intending to pursue a career as a nurse upon graduation. The scholarship is open to applicants working toward a two year or four year college degree. Follow this link to see the site page and downloadable application. Check out on Department of Higher Education website on Monday, February 2nd for summary information. The Nursing RFP focuses on a wide variety of topics relating to academic progression. 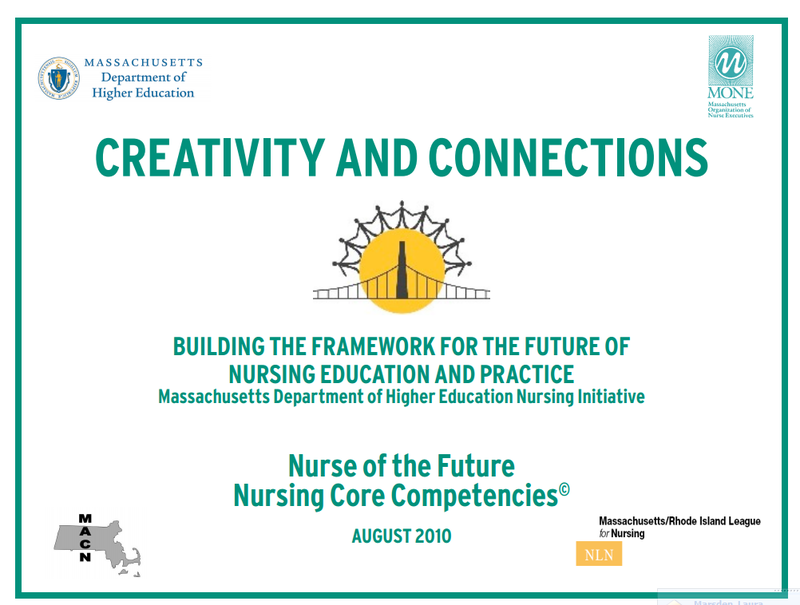 The Creativity and Connections report of the Nurse of the Future Nursing Core Competencies published in 2010 which summarized the work of the NOF Competency Committee. In the report, the committee describes the process it used to identify NOF Nursing Core Competencies, presents the NOF Core Competency Model©, and defines the ten NOF Nursing Core Competencies and the knowledge, attitudes and skills associated with each. The Healthcare Workforce Transformation Fund Planning Grant is designed to provide applicants with funds to support planning to address workforce challenges that occur as a result of the requirements of implementing Chapter 224.
provide training or educational services for healthcare workers in emerging fields of care delivery models. The NELRP & the NSP now fall under NURSE Corps: Caring for Communities in Need. While this name may be new, these are still the same great programs which have supported a community of nurses and nurse practitioners since 2002 who provide quality health care to underserved areas throughout the U.S. and its Territories. Through the NURSE Corps Scholarship Program (formerly the Nursing Scholarship Program) and the NURSE Corps Loan Repayment Program (formerly the Nursing Education Loan Repayment Program), NURSE Corps is empowering and enabling nurses to follow their passion for helping and healing others. The NURSE Corps Loan Repayment Program (LRP) offers Registered Nurses (RNs) and advanced practice registered nurses, such as Nurse Practitioners (NPs), an opportunity to repay 60 percent of their outstanding qualifying educational loans in exchange for a two-year service commitment at a Critical Shortage Facility (CSF). NURSE Corps LRP participants may receive additional loan repayment for a third year of service. The U.S. Department of Health and Human Services (HHS) Health Resources and Services Administration (HRSA) announced this week the establishment of the new Faculty Loan Repayment Program (FLRP). The program provides nurses interested in teaching with loan repayments to serve as a faculty member in an accredited and eligible health professions school. FLRP participants contribute to the HRSA's Bureau of Clinician Recruitment and Service's goal of increasing the recruitment and retention of health professions faculty. Eligible participants can receive as much as $40,000 towards repayment of their student loans in exchange for participating in future educational programming.